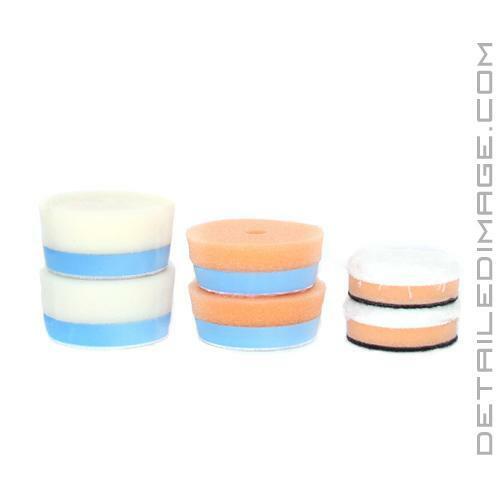 CarPro Mini Polishing Pads 2"
Remove imperfections in tight areas easily! The CarPro Mini Polishing Pads 2" are designed to help you remove imperfections and finish down your paint in those hard to reach areas with ease! This pad kit comes with 6x individual pads, 2x 2" CarPro Microfiber Cutting Pads, 2x 2" CarPro Polishing Pads, and 2x 2" CarPro Gloss Pads. Each of these pads will help you in specific areas on your smaller 2" backing plate. CarPro Microfiber Cutting Pads - These pads will help you remove medium to heavy imperfections safely and easily. They feature a foam base with microfiber face for increased ventilation and even pressure distribution when in use. CarPro Polishing Pads - Designed for light to medium polishing, these pads are the perfect pads to use if you do not have severe imperfections, or if you are following up some heavier correction with the Microfiber Cutting Pads. Their beveled edge and a dense elastomeric polymer foam base layer conform to contours and keeps the pad face flush to the surface. This improves polishing results and keeps heat to a minimum. CarPro Gloss Pads - The Gloss Pads are designed to remove light imperfections and finish the paint down to perfection. Use as a stand alone pad for light imperfections, or as a final step to bring all of your polishing work together. For a complete breakdown of these pads, check out the product description by clicking here.